Greek Minister of Finance Yanis Varoufakis and Prime Minister Alexis Tsipras at the height of the Grexit crisis in April 2015. First memorandum was imposed. Mass economic struggles developed. Greece had a record of general strikes and demonstrations. Although these struggles were fierce, they were not coordinated and lacked a concrete plan on the street and, more importantly, on the political level. This movement gave its last battle on the street on February 2012, when the parliament was voting a new memorandum. For an entire evening, the people clashed with the police in front of the parliament and refused to leave the square even when the police turned it into a gas chamber. The memorandum passed, our class camp suffered one more defeat. That movement would not re-emerge for a while. After a brief period of low expectations and lack of prospect, the wind changed: SYRIZA put forward the slogan of a left government, gave a political prospect to the masses and their support exploded. From a small party that took 4-5% of the vote, it rose to 17% on the elections of May and 26% on the elections of June 2012. The communist left was too incompetent to do anything similar. While the battle was now being waged on the central political level, the largest part of our left thought that the only thing we needed to do was go to the workplaces and agitate. If we had managed to project a slogan of a workers’ government that would take the necessary measures (on the basis of a transitional program etc.) back then, the situation could have turned out totally different. On the double elections of summer 2012 New Democracy won, our class camp was defeated again and retreated. The bourgeois class, reinvigorated with a “fresh popular mandate”, escalated repression. The state became what we call a state of emergency. The fascist vermin Golden Dawn emerged from the elections, taking 7% of the vote, and our class camp had to deal with them too. Needless to say, almost nobody knew anything about fascism and how to fight it; while the Stalinists were dusting off Dimitrov  (or, in the case of the third period Stalinists of the KKE, Dutt, who advocated for the great theory of socialfascism, whose ‘success’ was marvelously and tragically played out in Germany),  the Trotskyists were searching for the united workers front to protect them from the fascist attacks and others entrusted this task to the police and courts of the democratic state. It is a long discussion which we can have if you like. Under the cover of the police, immigrants would get stabbed late at night, communist workers would be attacked. Again, our class camp did not manage to stand its ground against the bourgeois onslaught. We lost ground on the street level. All expectations shifted to the electoral field. On January the 25th of 2015, SYRIZA won the elections with the promise to cancel the memoranda. The way to do this was, according to SYRIZA, a hard negotiation with the European “partners” that would result in a “mutually beneficial solution”. At the same time, the domestic bourgeoisie would be convinced that the Greek economy can only recover from the crisis through growth, something that could not happen with the memoranda that plunged it deeper into recession. Unlike the common perception that this victory came on the wings of the mass movement of the previous years, the truth is that it came on the wings of its defeat. The line of SYRIZA was contradictory. This strategy was a dead-end one; reformism may be very good at bargaining the price in which workers will sell their labour force in “good times”, but has no subject in times of crisis. Allow me to elaborate a bit on the issue: during the “good times”, the ruling class of a well-functioning capitalism is able to win the consensus of the oppressed masses by throwing to them some crumbs from the table. Agreeing to a social contract with them. Workers bargain collectively the price in which they sell the labour to the bosses, trade-unions have a say in that. There is room for a petty-bourgeois layer and a workers aristocracy to form under the bourgeoisie. A welfare state can be preserved (free health care, education etc). If this capitalism gets a share of the imperialist plunder of the third world, the contract may contain even better terms for the subordinate classes within the country. In such an environment, reformists have a role (either to simply beg the bourgeoisie to throw some crumbs to the workers or to demand these crumbs through strikes, parliamentary action etc). However, in times of crisis this is not the case. The social contract is violently ripped apart. The ruling class cannot withhold its reign over the subordinate classes by using the carrot; it can only use the stick. Greek GDP was 240 billion euros in 2010; now it is around 180. ‘Our’ capitalism can only function by using the stick. This is a situation that no left government can change – unless it proceeds to expropriate the bourgeoisie, something that SYRIZA, which is not a revolutionary party after all, had never promised to do. In any case, the victory of SYRIZA was the time to test this contradictory line in practice. For seven months the SYRIZA government tried to negotiate with its “partners”. Despite the inability of the “left opposition” (inside and outside of SYRIZA) to exploit this period, the height of the contradictions of SYRIZA combined with the depth of the political and social crisis caused a major political development: the referendum. On the one hand, our bourgeoisie and its courtyard. They were actually terrified. Their line was that a NO vote will mean an exit from the Euro, the EU and that we will become Syria after the seven plagues of the pharaoh hit us. Their fear was real; the geopolitical orientation of the country as part of western imperialism is non-negotiable for “our” bourgeoisie, EU and NATO has been in its DNA ever since it won the civil war and rebuilt the country within the Marshall Plan framework. And this lousy Tsipras was putting the country’s solvency towards its partners in danger!! A reactionary movement raised its ugly head under the slogan “we stay in Europe”. Pro-capitalist forces started gathering at the central square of Athens demanding that Tsipras signs whatever the lenders ask him to sign without further discussions. 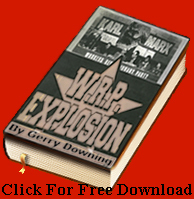 This movement followed the methodology of the CIA for colour revolutions to the letter. The tone of the rallies is clear anticommunism coupled with bitter hatred towards the oppressed. The crowd held placards that call for the sacking of the “lazy public servants” (apart of course from the police, army and clergy). Employers did not pay wages and terrorized workers into voting yes. Pro-employer unions order their workers to attend the reactionary rallies. Fascists roamed throughout the crowd. People brought their children and put bills of euros to their foreheads while holding placards that read “no to Stalinism in Greece” – and we all understand that their critique on the period associated with Stalin’s name does not stem from a revolutionary perspective. Until the last moment, the polls show that no and yes take an equal percentage of the vote. Profound politicians of the bourgeoisie threaten openly with a coup if Tsipras does not sign. Vangelis Meimarakis, leader of New Democracy (which is the main bourgeois party), states that “if there is no deal, the citizens of the bourgeois class will react”. Another one talks about “an invasion to the government’s headquarters” and others for “national treason”. And what about the other class camp? Without any serious political guidance and plan, unprepared, faced with the internal and external reaction, faced with the wrath of all the bourgeois parties, with the KKE not willing to join the fight and calling for a spoilt ballot. And with SYRIZA’s leadership trembling and prominent members talking until the last minute about cancelling the referendum. Despite all that, our class camp endures. Two days before the referendum, more than 150,000 gather at the central square of Athens and shout a big NO. They stand up to the threats of the bourgeoisie (domestic and foreign) and vote massively NO. 61.3%, when all the polls were claiming until the last moment that it was 50-50. The bourgeois class has proved to be incapable of socializing its interests and fears to our class camp. Poor Tsipras is in despair… He only wanted a better bargaining tool or a way to shake off the responsibility of signing the memorandum… What he now sees unwavering before his eyes is a fierce clash of tremendous proportions, a clash that he is neither willing nor able to handle. And in any case, he has never promised to do anything like that. So the day after the referendum he meets with the leaders of the bourgeois parties, resurrecting them from the dead, and says that the referendum had no losers or winners and that the mandate was for the government to find a solution within the Eurozone. He does exactly what he would have done if he had lost the referendum. After a while he signs everything the lenders ask. He comes out and says that by doing so he prevented the civil war. And he was telling the truth. The real question posed after the referendum was “who rules this country”. Does the bourgeois class still rule, or will these lousy dirty and ignorant masses be allowed to impose their will? The thing is that anybody who wanted the latter would have to impose it. And this would mean winning the civil war. No alternative leadership steps up for the task. We lose. This defeat is ratified in the elections of September. We often used the term “popular front” to describe it. Note the quotation marks: to try to fit SYRIZA into the schema of a popular front according to the standards of Spain in the ‘30s is absurd. SYRIZA lacked a solid base in the working class in organizational terms. However, and this is important, it did have one important aspect of a popular front: one foot in the working class and one in the bourgeoisie. The SYRIZA led government – and SYRIZA itself – was a class collaboration government. Its left component, SYRIZA, was a product of the class struggles of the previous years. It was not directly bourgeois. The bourgeois class never sought collaboration with such a party. This collaboration was imposed on the bourgeois class. The period leading to the elections of January 25 2015 saw a counterrevolutionary policy, a state of emergency that trampled most of the democratic rights as well as harsh austerity that destroyed part of the links the bourgeois class had with the subordinate classes. 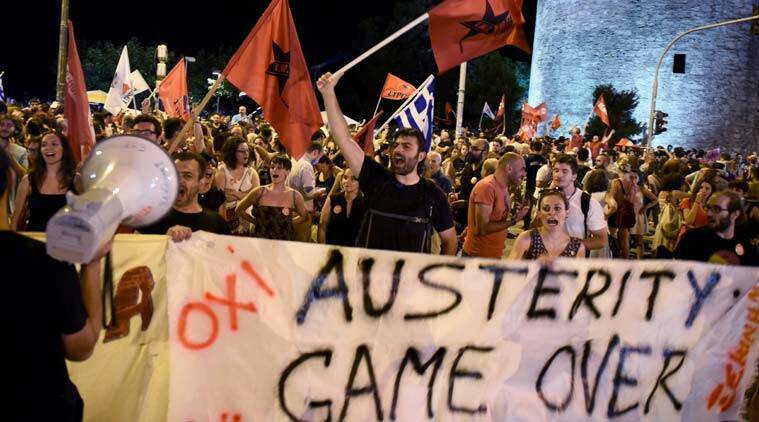 Combined with the struggles that took place during those years (in which SYRIZA always took part, acting as a reformist party), this brought the weakening of the political alternatives of the bourgeoisie and forced this class to accept the SYRIZA-led government. SYRIZA stood in the middle of the class struggle of the previous period as well as some of the expectations of our class camp at the central political level. Only SYRIZA could not fulfill these expectations; and here lay an interesting contradiction that everyone wanting to drive things towards the revolution and communism needed to take into account and try to exploit. In essence, SYRIZA in office acted as a fence separating the two rival class camps. Unfortunately, it was only the bourgeois side that was pushing, with our class camp simply waiting to see what would happen. The fence, which could not stay up forever, collapsed on our heads. “Revolutionary policy under these circumstances, in these elections, is to open the way for the confrontation. On January 25 2015, those who understand that the task of the moment is the ousting of Samaras should vote for SYRIZA. This is the most suitable tool for this purpose. A vote for SYRIZA is a vote for the ousting of Samaras and Co. It is not a vote for its current program, and it is much less a vote for the program SYRIZA will develop should it win office. The SYRIZA ballot is a tool, exactly in the way that a barricade is a tool during a street clash. The dilemma of the elections of June 2012 returns. The elections of January 25 is a de facto rematch of that fight. 2.5 years may have passed since, the government may have imposed almost all the measures of the memoranda, the social counterrevolution may have dismantled the 3/4 of what used to be the welfare state and the social contract in Greece, the movement may have faced repeated defeats, having lost most of the battles, but the war is not over yet. The bourgeois counterrevolution that has been going on for five years now will not be defeated in a ballot box on January 25. In fact it will not stop with ballots. The outcome of this battle will not be decided in the legislative work of the next parliament, but in an overall confrontation with the state and deep-state mechanisms developed under the rule of emergency. In the confrontation with the emboldened capitalists who now have their own private armies consisting of hooligans and paid gangsters, ready to off those who put obstacles to the plans of their bosses. With the fascist filth lurking to play its historic role even if currently the official state seems to not tolerate them. The struggles for wages, pensions, the ERT (public TV), reclaiming the squats by the anarchists, Skouries (a struggle against a multi-national cooperation that wants to destroy an ancient forest to build a gold mine), university asylum as well as the struggles against concentration camps for immigrants, all fronts will open again under new conditions, which will be more favorable for the movement and the Left. This can only happen with the defeat of the current government and the formation of a government of SYRIZA. The eviction of the government from office is a first step, a breath for the movement in order to begin its counterattack and open a new round of class confrontation. • No class peace with the bosses! • No tolerance to the emergency state! Having said the above, let us go back and try to imagine a different setting. Let us suppose that SYRIZA had lost the elections of January, as they had lost the elections of June 2012 – back then, the avantgarde website (the KED had not been formed yet) had also called for a vote for SYRIZA. What would happen? The bourgeois counterrevolution would have gotten a fresh “popular mandate” and the new memorandum would have been signed within a month after the elections. The victory of ND would have meant the justification of the previous five years of onslaught against the working class, the youth, the immigrants, the oppressed. It would have meant the justification of the state of emergency, the escalation of the bourgeois attack against what remained of the political and democratic rights. Plus, it would mean the further emboldening of the national body. SYRIZA would have remained intact and kept repeating its story. “The government does not negotiate, they are corrupt, blah, blah, the memorandum is bad, blah, after the Greek people put us in office four years from now we will fix everything with one law.” At the same time, our class camp would internalize defeat at all levels and would start looking for a ticket to Germany or the US. – Through an insurrection that would oust Tsipras, smash the bourgeois state and establish a workers one. That would be great; but if we called for that, we would simply be adding one more empty slogan to the list. Nothing would happen, nobody would be mobilized. Our class camp was frozen at the time. We did not have the power to do it based on our own forces. Using such a slogan would only help in the salvation of our eternal souls. – Through an indefinite political strike against the new memorandum. That would also be great, but there was no trade union action at the time. At the same time, the organized forces of the movement were either waiting patiently for Tsipras to sign so that they could come out and say “we told you so” (KKE) or simply did not have a plan instead of repeating the usual loose collection of slogans which they think constitutes a transitional program (ANTARSYA and various groupings). 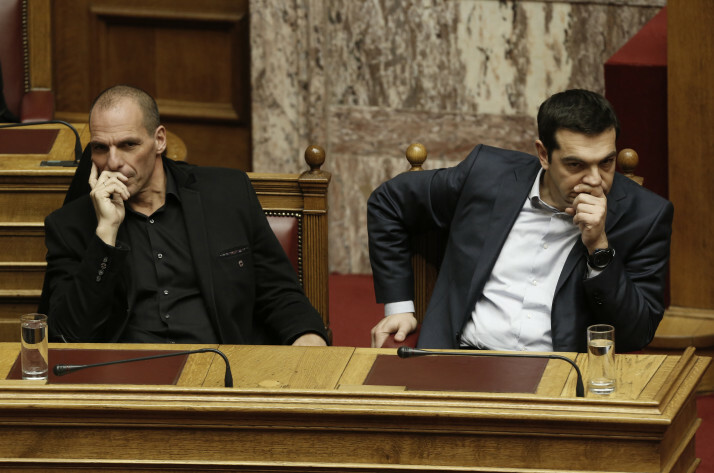 – Through the opposition within SYRIZA. Maybe the “left opposition” within SYRIZA could change the course of the party? Hardly. To do so, they would have to challenge the captain of capitulation, Tsipras, take the leadership from his hands and take responsibility for leading the rupture with the EU and the bourgeoisie. None of them had even hinted at the existence of such a plan (except for the Communist Tendency, IMT, whose size and influence was extremely small). In the absence of other viable options, we chose cheating. Our proposal was this: bring us the package of measures and ask whether the people accept or reject it. This was the only process which could divide the class camps at the given moment. This was the only process that could mobilize the vanguard of our class camp again, those who had fought for all these years and did not want to live in chains, who were at the time paralyzed and spent their days staring at the TV trying to figure out what the hell was going on behind the veil of all this secret diplomacy. This process would, most importantly, tear apart the “national unity” concept that SYRIZA had been promoting, namely that poor little Greece is fighting as a whole against the bad Europeans, and unmask the class nature of austerity and the memoranda. Ok, Tsipras and his conclave had decided to sign the memorandum – although this decision might change, as the EU were at the time consciously trying to humiliate and crush them, sending a crystal clear message to everyone who might get wrong ideas: “there is no alternative to eternal austerity; those who question it will be crushed without mercy”. But even if the SYRIZA leadership’s decision remained to sign the memorandum, was it certain that the SYRIZA MPs and the party would accept this? We would have to see about that. At the same time, we were interested in complicating the game, in inserting another parameter in the conversation, which until then only involved the bourgeoisie screaming that Tsipras was endangering our country’s future with his adventurism (i.e. by not signing what the lenders demanded) and SYRIZA apologizing. At the time, we considered it a real possibility that even the announcement of a referendum would function as a bomb for the negotiations, would lead to a default and a large destabilization. The Emergency Liquidity Assistance (ELA, a mechanism that provided the Greek banks with cash) would probably be over for Greece – goodbye Euro. And who knows. Maybe, just maybe, such a development could cause the finance bubble to burst, turning Greece into the Lehman Brothers of Europe and bringing the crisis from the periphery to the very heart of the EU and western imperialism. The class differences would then be unlocked – and not only in Greece. All the above can be found in our articles published prior to the announcement of the referendum, all of which are unfortunately in Greek. The day when the referendum was announced, we issued this statement. The announcement of the referendum constituted a break with the bourgeois class. Of course, this break was a reformist break – half, incomplete, vague and unprepared – and the government did not even understand it as such (a break with the bourgeoisie), but this did not change much. Our task now was to take this incomplete break to the end, to complete it. To make sure that the referendum takes place – against the will of the bourgeoisie and against the oscillations of SYRIZA – and ensure that the NO won. In the best case scenario (in which Tsipras was forced even by accident, pushed against the wall by the counterrevolution, to not capitulate completely), the bourgeois class, foreign and domestic, would stage a coup (a velvet one or possibly a hard-core one). Such a development would have meant the intensification of class struggle, not because Tsipras wanted it, but because the bourgeois reaction was not willing to tolerate any crap regarding who the boss of the country is. We openly and consciously pursued this intensification. In such a development, our class camp would have no choice but to fight. It is true that our class camp was not prepared for such a development. Without a real revolutionary leadership, the most likely scenario is that a Chile scenario would unfold, which would plainly mean that we would be massacred or thrown in the dungeons. A comrade from the IG-LFI who came to Athens and met with us had characterized this position as “adventurist”. He was absolutely right, and I accepted it. But, at the same time, maybe our class camp would find the strength to prevent the Chile scenario. In any case, we were not about to use our lack of capacity as an excuse to not enter the battle; the fact that so far we had been unable to forge this revolutionary leadership was not something we could change at the time and there is no use in crying over spilled milk. And who knew; maybe in the heat of the battle against Kornilov (if you excuse my analogy) we would be able to gather enough forces to organize the proletarian defense against the bourgeois sabotage, only to turn them against Kerensky later. And even if we did not manage to do anything, the proletariat and oppressed of some other country might have picked up from where we had left it. Let us imagine that the YES prevailed at the referendum. What would happen? Tsipras and Co would go to Brussels the following day, sign the memorandum and begin to implement it. With the utmost legitimacy! This is what the people asked after all… Our class camp would be more demoralized than what it is now. “Tsipras cannot stand up to the challenge of ending austerity. Why is that? There are forces in the Left that say that there can be no end to austerity within the framework of the Euro, and some others that say that there is no end to austerity within the framework of the European Union. Both of them are basically not wrong, but they are missing the most important point. That there can be no end to austerity within the framework of capitalism itself. Do not go looking for the enemy in Berlin or Brussels. The enemy is at home, it is our own bourgeois class. What is going on in this country is not that big bad Merkel is imposing harsh measures of austerity on Greece as a whole. What is going on is that the bourgeois class, foreign and domestic, is implementing its plan of bourgeois counterrevolution. Although this description may bring to mind the united front tactic, it is not it. Our size compared to SYRIZA did not allow any illusions that we were in some kind of a united front. But the KKE had the relative weight to do something like what I am describing. The “far Left” within SYRIZA fostered illusions (in which they actually believed, as they still believe in the tactic of the anti-capitalist anasynthesis) that SYRIZA can somehow be transformed to a party that can end austerity – that is to be transformed to a revolutionary party. So they never considered it as their duty to challenge Tsipras’ ‘managerial prerogative’ and try to seize the party leadership from his hands. Until the last moment, they would begin every speech they gave by giving oaths to the holy unity of SYRIZA that was a “party of its members”, which Tsipras could not possibly defy etc, coming to the conclusion that he was not going to sign anything bad. Never did they challenge the secret diplomacy of the government, which was leaving our class camp in the dark about what was going on. All they did was whine and ask the leadership to stay true to SYRIZA’s promises and “red lines”. To be fair, let me differentiate here the stance of the Communist Tendency (IMT) which, despite any criticism we may have against it, was calling for a change of leadership and the adoption of an anti-capitalist program from early on (since after February the 20th). We also criticized the various other groups (Left Platform led by Lafazanis  and groupings within and around ANTARSYA)  who had held the anti-Euro or the anti-EU as their banner, fostering illusions that after an exit from the EU we would all live happily ever after, that such a step would not lead to a civil war; according to their leading economists, after such a development “we” as a country would proceed to reorganize “our” economy, free from the shackles of the imperialist EU, and after a difficult initial period (due to the devaluation of the drachma) the economy would… flourish. And of course, we criticized the KKE for refusing to struggle against the bourgeois reaction and essentially extending a helping hand to the bourgeoisie. When the referendum was announced, the general secretary of the party met with leaders of the bourgeois parties to assure them in a very friendly manner that his party’s no had nothing to do with the no advocated by SYRIZA – i.e. that the KKE will be good and not cause any problems to the bourgeoisie in this important fight. The bureaucracy of the KKE leadership is only interested in prolonging its sorry existence. At the same time, almost nobody in the Left understood the need to fight against the human dust of the bourgeois counterrevolution that was making efforts to appear out on the streets during the summer (“we stay in Europe” movement). These pro-capitalist (also anti-government) rallies were the equivalent to Kornilov or the Maidan and needed to be crushed without mercy, to not be given any space – especially not the central square of Athens! But our comrades in the Left were too concerned that they might be seen as supporters of the government were they to take any such action. When we issued the first call for a counter-demonstration against these vermin, no organization of the Left attended. The only ones to gather were the KED and an organization of Anarcho-Stalinist origin. On that day, we only managed to gather 200 people at the same square where the reactionaries would gather. We confronted them for a while, then retreated in a organized manner. More organizations responded to our following calls – the OKDE-Spartakos (component of ANTARSYA, Mandelites),  the ORMA (Organization for Militant Antifascism) and Rocinante (anarchosyndicalists) – but still we are talking about a tiny minority. Finally, and this is the most important part, almost nobody in the Left had a plan for the implementation of which they were willing to take responsibility. Ok, the KKE was simply trying to preserve its existence, let us leave it aside. But the others, from those who believed that they could pressure SYRIZA from the left to those who believed that SYRIZA could become a revolutionary party, were simply hiding behind Tsipras – the subject who would lead the rupture with the EU or capitalism or I-don’t-know-what was Tsipras according to them. But a revolution is not something that happens when reformists or trade unionists or I-don’t-know-who are pressured from the left. Revolutions require a conscious political plan and a political subject that will take responsibility to implement this plan. Revolutions do not happen by mistake or despite the will of their protagonists. The defeat suffered by our class camp in the summer of 2015 closed a round of a certain form of radicalization, namely the “popular front” kind of radicalization. By that term I am trying to describe a wide, massive wave of radicalization that had swept across Greek society between 2010-2012 and, to a lesser extent, 2012-2015. This radicalization wanted an actual change, but was not mature enough to identify the enemy. It refused to look for the enemy at the right place (always blaming the “foreigners” or the “traitors” etc and missing the domestic bourgeoisie under a veil of “national unity”, “poor little Greece vs big bad Europe” etc). This form of radicalization, which stood for mostly easy solutions and ways out of the crisis, was able to appeal to a large number of the population. From now on, such a mass radicalization will not be repeated. There will still be some radicalization, but of a different quantity and quality. The biggest part of the proletariat is demoralized and in the search of individual solutions, especially in the absence of a credible working class political alternative. The bourgeoisie is escalating the assault against workers’ rights, tearing apart what remains of the ‘welfare state’ and making clear that the era of the social contract and of a certain arrangement between classes is gone for good. This process is met with very little resistance from our class camp. We argue that the vanguard should come to terms with the fact that the time of social protest and class struggle within the acceptable bounds of the previous period is over. The SYRIZA experience provides further proof that there is no way forward but the intransigent struggle against the bourgeoisie and its state. The article by comrade Downing is a good one. We agree with the criticism he makes regarding the positions of the KKE and the SEP, and with the necessity of a transitional method. His criticism towards the Greek leftist groups is quite to the point, too; especially the part where he mentions that almost nobody bothered to address the issue of the state. The title might have been a bit too optimistic, but he is certainly not to blame for the incompetence of the Greek Left. We have also read the statement of the CLQI. We consider it an important document, but do not have the time to address it in the way we should at the given point. I hope the above help to clarify our perspective a little better. We are of course open to any critique and comments you may still have. 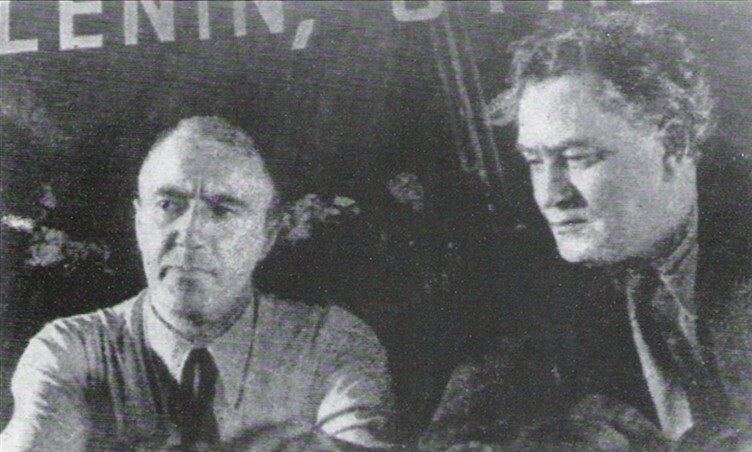 Harry Pollitt with Georgi Dimitrov, General Secretary of the Communist International, at the Seventh and last Congress of the Comintern (1935). Georgi Dimitrov, The Fascist Offensive and the Tasks of the Communist International in the Struggle of the Working Class against Fascism, Main Report delivered at the Seventh World Congress of the Communist International. “Fascism is the power of finance capital itself. It is the organization of terrorist vengeance against the working class and the revolutionary section of the peasantry and intelligentsia. In foreign policy, fascism is jingoism in its most brutal form, fomenting bestial hatred of other nations … Comrades, fascism in power was correctly described by the Thirteenth Plenum of the Executive Committee of the Communist International as the open terrorist dictatorship of the most reactionary, most chauvinistic and most imperialist elements of finance capital … In mobilizing the mass of working people for the struggle against fascism, the formation of a wide anti-fascist People’s Front on the basis of the proletarian united front is a particularly important task. The success of the whole struggle of the proletariat is closely bound up with the establishment of a fighting alliance between the proletariat, on the one hand, and the laboring peasantry and basic mass of the urban petty bourgeoisie who together form the majority of the population even in industrially developed countries, on the other”. 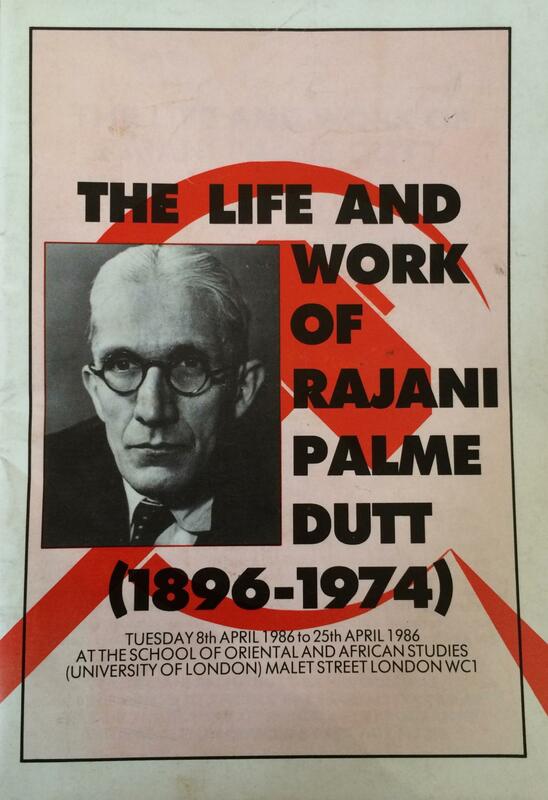 Rajani Palme Dutt (1896-1974) was a champion of the lunatic Third Period Stalinist line in the British Communist party (CPGB) from 1928 where the world was ripe for socialist revolution everywhere and every other political tendency who could not see this outside of Stalinism was some variety fascism. Roosevel’s administration in the USA was a prime example of fascism, he stoutly proclaimed, even when his popular front USA comrades were making alliances with him. In his book ‘Fascism and social revolution’, reprinted as late as 1936, he continued to defend this line even after Hitler had come to power largely because the German communist party, the KPD, designated the German Social Democrats (SPD) as the main ‘social-fascist’ enemy. They collaborated with the Nazis on several occasions against this ‘main enemy’ and even after the line led to the ultimate disaster in January 1933 he still clung to it. “After the Nazis us” they sang until stopped by the concentration camp bullets. But Palme Dutt sailed on to replace Harry Pollitt as General Secretary from the Hitler/Stalin pact of August 1939 to the invasion of the USSR in 22 June 1941. Poor Harry could not understand how the Popular Front line of class collaboration to defeat fascism, the greatest enemy of all humanity, now gave way to support for Nazi Germany, via a pact and demands that Britain and France should make peace; effectively surrender to Hitler. But Palme Dutt never had a problem with whatever line Stalin wanted to push, even though it was the diametrical opposite of the previous line. The Wikipedia entry on this incident is disingenuous: “In 1939, when the CPGB General Secretary Harry Pollitt supported the United Kingdom’s entry into World War II, it was Palme Dutt who promoted Stalin’s line, forcing Pollitt’s temporary resignation. As a result, he became the party’s General Secretary until Pollitt was reappointed in 1941, after the German invasion of the USSR and consequent reversal of the Communist Party attitude towards World War II.” That entry is so misleading as to amount a complete Stalinist lie. Of course Stalin opposed Britain going to war with his ally Adolph Hitler but could you really publicly defend tha line? No problem said Palme Dutt and his allies in the CPGB who overthrew poor Harry for his ‘revisionism’. ‘The Greek Revolution has begun! Vote NO!’, 02/06/2015, The Greek Revolution has begun! Vote NO!